The Dodge Challenger was essentially Dodge's twin of the Plymouth Barracuda. However, despite sharing the E-body status the Challenger was slightly longer wheelbase than the Barracuda. As well, it incoporated a more prominent beltline shape and used 4 headlamps. Regardless of the differences, the challenger was targeted directly at the youth market. Challengers had a large number of performance image items such as scoops, dual racing mirrors, and wild color schemes. 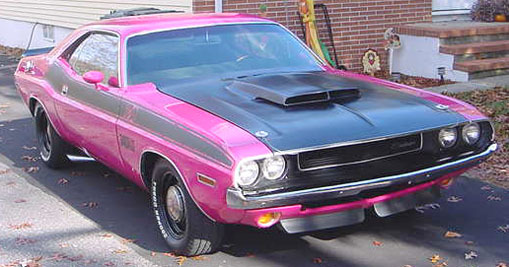 The Dodge Challenger was introduced in 1970 and stopped production in 1974. However, the name carried on with a few other non performance models. Current rumours indicate the car willl again be in production in 2009 to compete with the recently restyled Ford Mustang and Concept Camaro. Interesting Fact: The Challenger was originally designed to compete with the Mercury Cougar. Base: slant six or 318 2bbl. However, options included the 340, and 383. However, at this level don't expect a performance image. R/T: 383 standard motor. Ralleye suspension, heavy-duty drum brakes. Ralleye instrument cluster, and performance hood (scoops). Also, optional bumblebee stripes. Optional motors included the 440, 440 six pack, and the 426 hemi. Optional Trak Pak (gears and sure grip). 4 speed models came with pistol grip shifters. SE: High trim level - wheel mouldings, bumper guards, vinyl roof, overhead interior console. R/T SE: Essentially and R/T with SE options. T/A: 340 six pack, side exhaust, heavy duty suspension, chin spoiler, rear wing, huge lengthy hood scoop, blacked out hood treatment. The 1971 Dodge Challenger had the R/T SE and R/T convertible were removed from production. The most noticeable change from 1970 were the grill (now has 2 small slits), the taillights, and the addition of 2 scoops on the quarter panels.